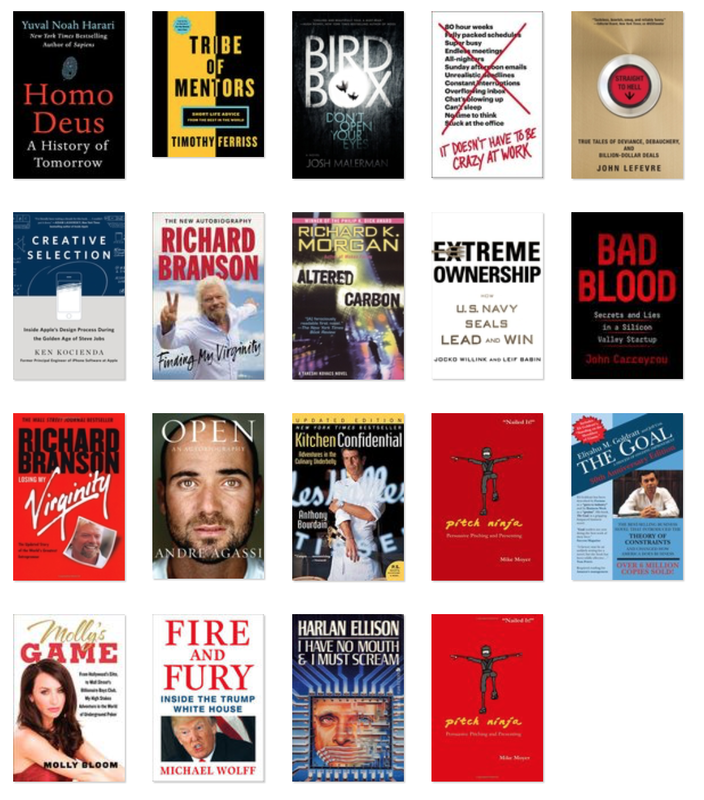 I read 18 new books and re-read 4 for a total 22 books this year. Not quite the 26 I was shooting for. 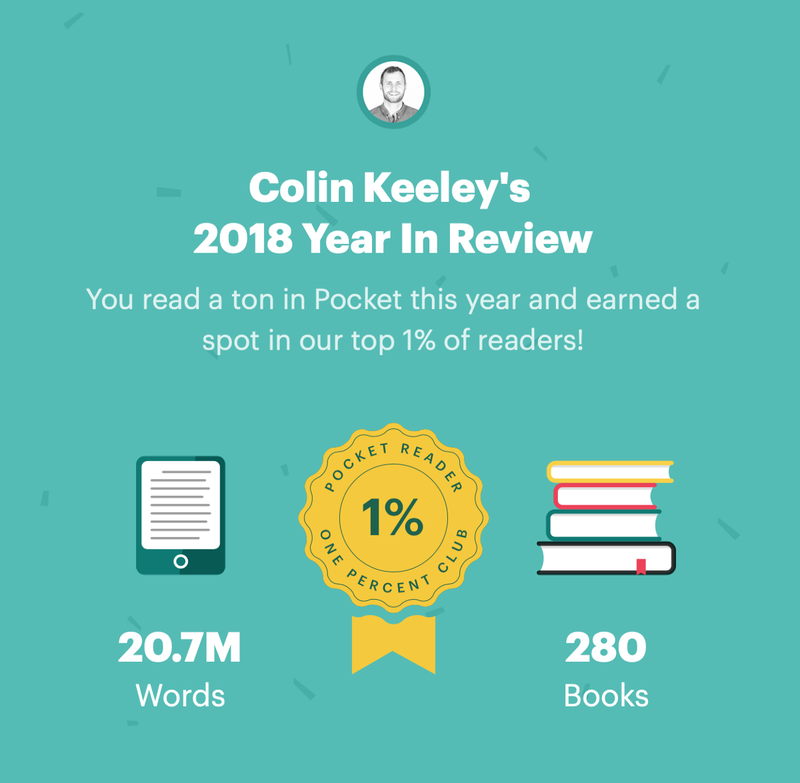 Again I probably spent too much time consuming pocket articles and podcasts. I’m not a person prone to vices, but I find it hard to pull myself from the daily meltdowns in the whitehouse. It is my reality TV. I consume far too many articles and podcasts on it. I suspect that had something to do with finally landing in the coveted 1% of pocket readers. 20 million words and 280 equivalent books seems pretty high to me, but who knows. I should really dedicate iOS’s text-to-speech and my wireless headphones (AirPods & Bose QC35s). I consume 99% of my articles and podcasts this way. Now back to books. Here‘s everything I read this year with some of my favorites at the top. Bourdain is a fantastic writer. I highly recommend the audiobook version which Bourdain reads himself. What could be better than hearing his story from the man himself? I enjoyed this book way too much. A scary portrait of an unfathomably bad president. One of the best books on the process of design at Apple. So much of what seems obvious today required years of iteration and collaboration. This was wild scam that I wouldn’t have thought possible until reading it. I wish we knew more about what was going on in Elizabeth’s mind and how she restionalized the lies with people’s lives on the line. Will make a good movie soon I’m sure. Yuval takes everything from Sapiens and tries to project what our past behavior means for our future. Big takeaway: we should be treating animals better. Humans will soon arrive at a similar fate. Entertaining read after watching the movie. Bizarre that running a poker game is illegal. Fun page-turner with an original concept. Read this in a day and a half before watching the movie. I love how lean Jason and DHH keep their books. Great advice. Nothing extra. Entertaining quick read similar to Tucker Max back in the day. A fun exploration of a future where our bodies are just sleeves for our minds and the very rich are effectively immortal. A good read before watching the Netflix show. Not as good as Losing My Virgnity, but still a worthwhile read. I’m not a tennis fan, but this was an honest and well told biography. Some good advice. A lot of ok advice. Good book to read a few pages of every once in a while. Took me about a year to finish. Required reading for an operations course. I appreciate the novel approach, but the whole marriage storyline should be cut. I normally wouldn’t read a leadership/self-help book, but I’ve enjoyed hearing Jocko on some podcasts and gave this a shot. It has good, if somewhat obvious, leadership lessons. I read this to get back into the wizarding world before going on the Harry Potter walking tour in London. The beginning and end of this book are pretty disturbing, but if you can look past that, this is a very unique take on artificial intelligence run amok.